Arrested Development Cast Spills Five Hilarious "Spoilers"—Including What's in David Cross' Pants! Tobias Funke Still Blue & a Nevernude? Step aside, Jon Hamm. You aren't the only man packing something totally obvious inside your pants, mmm-kay? 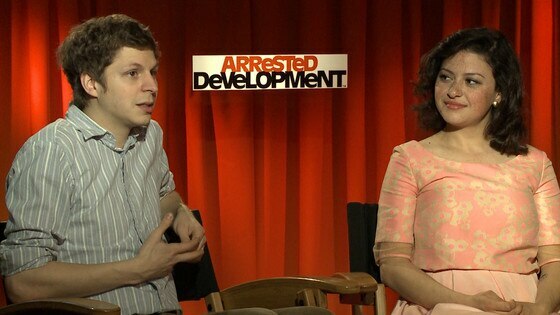 EXCLUSIVE: There will be more Arrested Development! 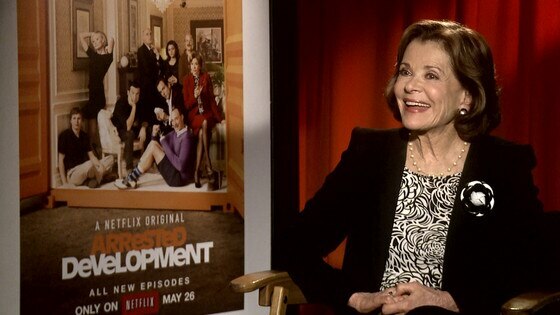 1) Kristen Wiig Will Win an Emmy…If Jessica Walter has her way! Wiig shot a guest spot, alongside Seth Rogen, as a younger version of Lucille (Walter's character) and, let the record show, it is outrageously good. The Saturday Night Live alum pretty much steals the show in the first episode by owning every trademark Lucille-ism and expression. Walter herself tells us, "She nailed it! I was thrilled. I've never met Kristen, I've never talked to her. I was so flattered that they got her and I thought, ‘Oh my God how great.' She's an incredible actress." 2) David Cross Has a Secret Weapon. In keeping with his character Tobias Fünke's psychosis as a "nevernude" (someone who wears jean short shorts at all times, even in the shower), Cross tells us: "I'm in a bunch of different outfits, but I always wore the short shorts underneath. It was a choice I made. Even if you can't see them, the short shorts are always on." Why is that strangely comforting?! By the way, David also is obsessed with Tobias' shorts. Over the years since the show ended, he tells us, "I would fly back from New York and sneak into the studio, I still have the pass key, and put on the shorts…Take a couple selfies and boom, I'm done." Cross also insists his real-life wife Amber Tamblyn is not a fan of the nevernude shorts. "She does not think they are hot and that's one of the reasons I married her." 3) Cousin Romance Is Back: In the first episode we screened, George-Michael (Michael Cera) puts a sock on his dorm-room door when cousin/unrequited crush Maebe (Alia Shakwat) comes to visit. And Cera and Shakwat tell us they couldn't be prouder to be bringing cousin romance back to TV, as it is such tragically unexplored territory, particularly since Arrested went off the air. "It's been a dry spell," Cera tells us. "Why isn't that a reality show yet?" Shakwat muses. Something tells us that somewhere, Fox reality boss Mike Darnell is writing that down. 4) Portia de Rossi's Lindsay Will "Go on a Journey": Portia and David wouldn't comment on whether their seriously dysfunctional coupling is still together, but it sure sounds like they'll be apart. "I got to do a little bit more than I got to do in the original series," Portia explains. "Lindsay was very one-note, very deliberately. Because she was an idiot. She still is that person but she attempts to grow. It takes her many places. I do go on a journey. I might end up where I started but at least I get out." 5) Tobias Fünke Will Blue Himself Once More: As a nod to his character's former (hilarious) work trying to become a member of the Blue Man Group (accompanied by the unforgettable line, "I'm afraid I just blue myself"), Cross refveals to us: "There's a moment where has zero to do with the Blue Man Group. But I do find myself in a situation where I need to be blue. I'll leave that for you to enjoy. It's in a public restroom." Can. Not. Wait. Anyone else staying up to watch all 15 episodes tonight on Netflix? Of course you are, ‘cause as Jason Bateman so wisely put it: "There's a lot of tweakers and coke addicts. We know when to air the show." See you there! 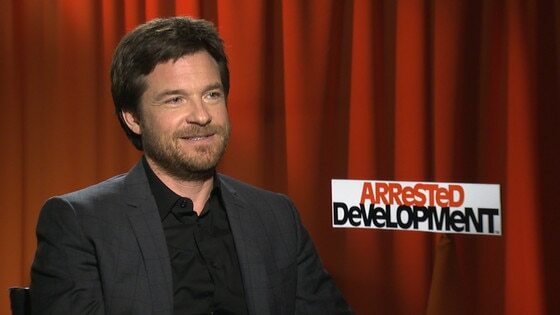 Check out our exclusive video interviews with Jason Bateman, David Cross, Portia de Rossi, Michael Cera, Alia Shakwat and Jessica Walter above and below! TWITTER: Follow @kristindsantos for more TV scoop!